MANILA—All-Filipino (First) Conference champion Valenzuela Workhorse opened its back-to-back titles bid in flying colors after clobbering Marikina Shoelanders, 98-79, in the second day of the Metro League Reinforced (2nd) Conference Tuesday night at the Valenzuela City Astrodome. Buoyed by their homecrowd, the Workhorses jumped to a 43-32 lead at the break and never looked back from there as they even ballooned the gap to as many as 25 big points en route to the win. 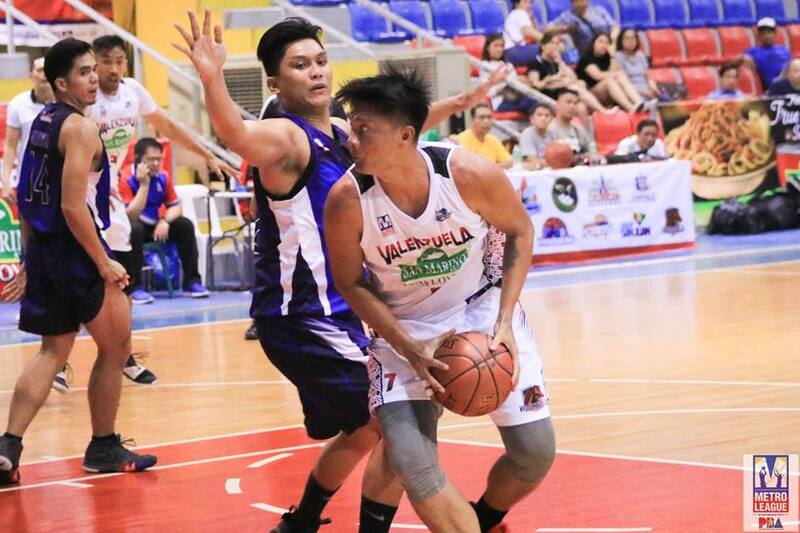 John Tayontong sizzled with 18 points, five rebounds, two assists and three steals for Valenzuela which joined Caloocan atop the Northern Division with identical 1-0 slates. Reneford Ruaya and Erwin Sta. Maria also added 15 and 13 points, respectively, for the wards of former PBA player and proud Valenzuelano Gerry Esplana. 40-year-old big man Marlon Basco, meanwhile, also another former PBA player, had his 17 points and 12 rebounds wasted in the loss of Marikina which slid to 0-1 in the Southern Division of the M-League formerly known as the Metro Basketball Tournament. Celebrity-Athlete Gerald Anderson also showed his ware with 15 points, five rebounds and five assists but still weren’t enough to lift the Shoelanders to victory. In the other game, Taguig City Generals edged out Quezon City Generals in a low scoring affair, 65-59, to also open its campaign on a winning note. Import Emmanuel Ojuola tallied 15 points and 14 rebounds for Taguig which bagged its first win in the M-League that is backed by the Metro Manila Development Authority (MMDA) and Philippine Basketball Association (PBA) with Barangay 143 as league presentor. Former PBA player Jonathan Uyloan was also instrumental for the Generals with all-around numbers of six points, seven rebounds, five assists and five steals. Taguig joined San Juan and Bacoor atop of the Southern Division with identical 1-0 records. On the other hand, Jefferson Comia and Roque Estacio Jr. served as the only bright spots with 19 and 16, points, respectively for the Juniro Capitals who fell to 0-1 in the Northern Division of this M-League whch also has Synergy 88, World Balance, Excellent Noodles and San Miguel Corporation as major sponsors. Taguig 65 -- Ojuola 15, Gilbero 9, Rublico 9, Francisco 7, Uyloan 6, Monte 6, Mayo 4, Alcantara 3, Gozum 2, Oliveria 2, Sampurna 2, Lontoc 0, Guiyab 0, Fabian 0, Orodlo 0. Quezon City 59 -- Comia 19, Estoce 16, Quattara 6, Mahari 6, Vasallo 5, Asuncion 3, Espanola 2, Bellosillo 2, Barraquias 0, Melegrito 0, Delos Reyes 0, Riva 0, Macaballug 0, Udjan 0. Quarterscores: 14-7, 26-20, 43-37, 65-59. Valenzuela 98 -- Tayongtong 18, Ruaya 15, Sta. Maria 13, Kalaw 10, Esplana 6, Diego 6, Dulalia 5, Monteclaro 5, Pascua 4, Rivera 4, Natividad 4, Dela Cruz 2, Gamboa 1. Marikina 79 -- Basco Marlon 17, Anderson 15, Mabigat 10, Basco Mario Jr. 10, Deles 9, Limin 5, Mendoza 5, Gines 3, Gali 2, Po 2, Llabres 1, Zapanta 0, Catipay 0. Quarterscores: 21-15, 43-32, 65-54, 98-79.